In the tutorial, I go step by step and share how I illustrate all the little facets and highlights to give the effect of sparkle and shine. I hope you find all my tips and tricks helpful when creating your own illustrations! Let me know what you think of the tutorial and be sure to subscribe to my YouTube channel so I can keep making more =) Without further ado… here’s the video! 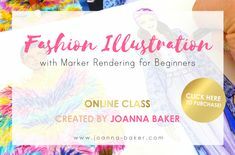 This entry was posted in Monday Mini Lesson and tagged artist, drawing tutorial, fashion, fashion art, fashion illustration, fashion illustration tutorial, fashion illustrator, how to, how to draw, illustration, illustrator, jewels, joanna baker, sketching jewels, sparkle, tutorial, youtube on January 25, 2018 by Joanna Baker.